I’ve had several people ask me lately about keeping fruit trees to a manageable size. Translation: no ladders. 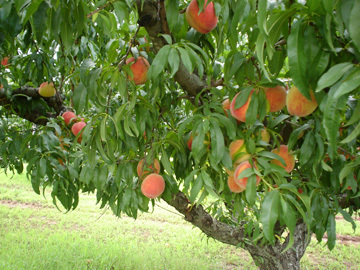 Tree size is a big deal and is the foundation of a happy backyard or hobby farm fruit growing experience. It effects everything else. When you are considering size, you have to think about pruning, thinning and picking. It’s all about reach. Other considerations are things like mowing around your trees. Keeping branches low enough to manage, but high enough to mow takes a balanced approach. Another important thing to consider is where to make the cuts on your branches. It isn’t just about getting rid of branches, but a little understanding of the physiology of plants and how branching occurs. It’s not rocket science, just knowing what to look for. As you can see in these videos, it really isn’t that hard. Just be consistent every year and you will have healthy trees producing more fruit than you know what to do with.